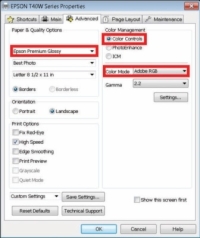 One method for managing color when you’re printing files from Adobe Photoshop Elements is to select a printer profile from the available list of color profiles installed with your printer. 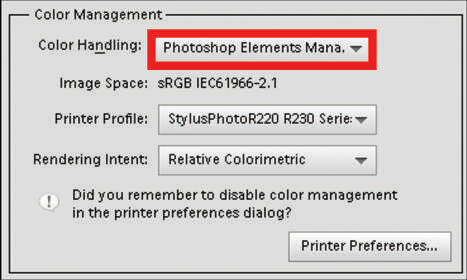 Whereas sometimes you use your printer to manage color, other times you let Photoshop Elements manage the color. 1Choose File→Print from the Photo Editor. 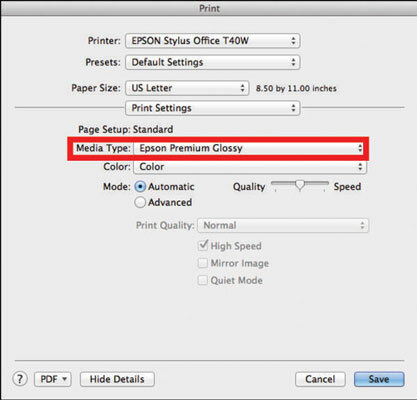 In the Print dialog box, click More Options to open the More Options dialog box. 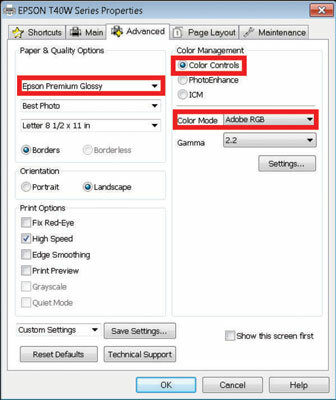 2Click Color Management in the left pane to display the color-management options. Click Photoshop Elements Manages Colors. 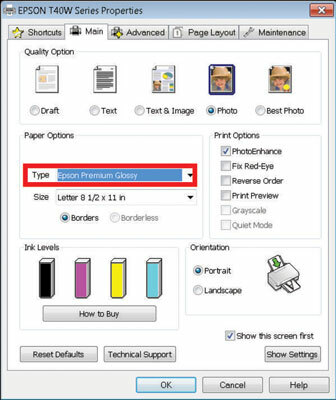 3From the Printer Profile drop-down menu, choose the color profile designed for use with the paper you’ve chosen. 4Click the Printer Preferences button. You arrive at the same dialog box shown in these figures (Windows and Mac). In Windows, click the Best Photo radio button. From the Type drop-down menu, select the recommended paper choice. On the Mac, make your paper choice as shown. Custom color profiles are also shipped with guidelines for selecting proper paper. 6Go to the Advanced settings. In Windows, click the Advanced tab and click Continue to arrive at the same dialog box shown earlier in the figure. On the Mac, choose Color Management from the pop-up menu to arrive at the same dialog box shown in the figure. The paper choice selection is automatically carried over from the previous Properties dialog box; refer to the figures. The one setting you change is in the Color Management section. In Windows, select the ICM (Image Color Management) radio button and select the Off (No Color Adjustment) check box, as shown in the figure. On the Mac, select the Off (No Color Adjustment) radio button. 8After making all the color-management choices, click OK.
You will return to the Print dialog box. 9Click Print, and the file is printed to your printer. Because you selected the color profile in Step 3 and you’re letting Elements manage the color, be sure the Color Management feature is turned off. If you don’t turn off Color Management, you end up double-profiling your print.